Vast swathes of sea have been covered by thick oil that probably leaked after two ships collided on Saturday, endangering marine life in the surrounding waters and health of residents around. 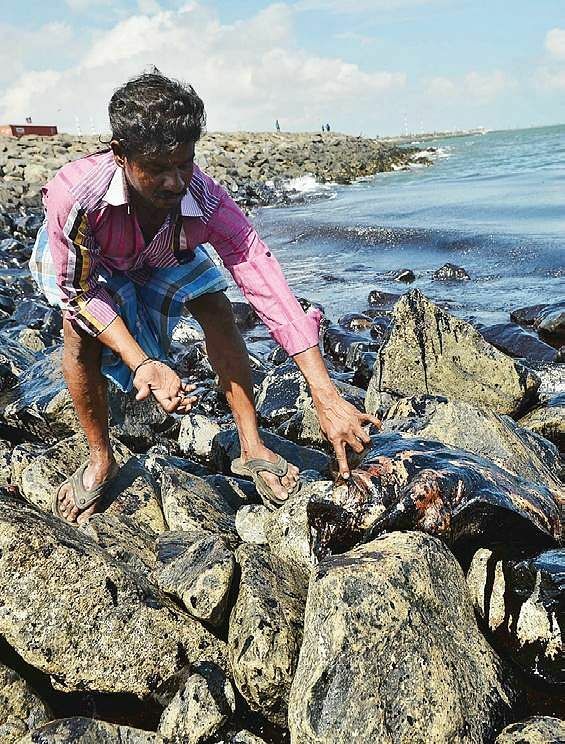 CHENNAI: A day after two merchant ships collided near the Kamarajar port, thick oil spill was reported across the Ennore shoreline by residents. Both the ships that collided were oil tankers, one carrying LPG and the other carrying petroleum products. The spilt oil was so thick that it remained stagnant and could not easily be scooped up in a mug. The spill has put marine and aquatic life in and around the area at grave threat. 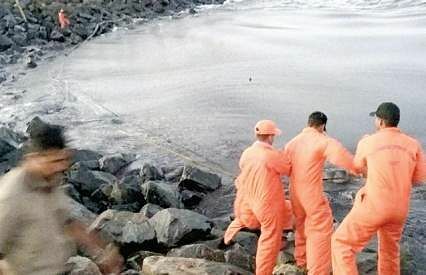 According to fishermen, oil started to collect near the shore from Saturday evening. “It was very little last evening, but had spread wide by this morning,” says R Robbin, who lives near the harbour. “Hundreds of fish have died in the spill. We returned empty-handed as there was no catch today,” say fishermen. MA Bhaskarachar, chairman of Kamarajar Port and authorities at the Tamil Nadu Pollution Control Board suspect the oil spill to have been caused by the accident, but are yet to get a confirmation. Environmentalists warn of the effects the oil spill could have on marine life and those who consume it. Carcasses of at least four turtles were found along the beaches after the oil spill. Crude oil, say experts, can be carcinogenic for fish, thereby affecting those who eat it. On normal days, a strong smell of salt and fish hanging in the air tells that the sea is near. However, Sunday was not a normal day. The only smell wafting through the air was that of oil. So strong, that the fishermen and visitors in the vicinity were forced to cover their noses with a mask. A closer look showed four big turtles washed up on the shore, completely covered in the thick black oil. 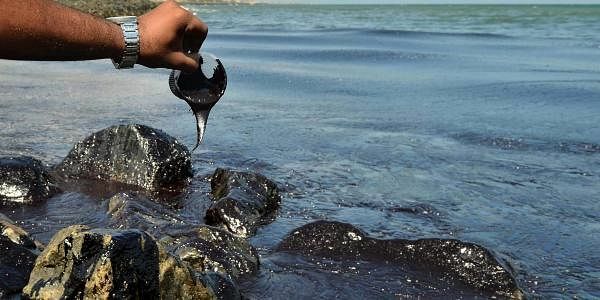 This was no ordinary oil spill, the shoreline near the Bharatiyar Nagar beach in Ernavur did not just have just the usual film of oil, it was so thick it remained stagnant. The Tamil Nadu Pollution Control Board officials said the spill could be a result of the two ships that collided on Saturday but weren’t sure. “There was a collision between an LPG tanker vessel, BW Maple, Isle of Man flagship, and vessel MT Kancheepuram, an oil and chemicals tanker, on the outskirts of Ennore at 4 am (on Saturday). So, this could be a result of that. As it is so thick, we are not able to understand what type of oil it is. We’re conducting an investigation,” said a senior official. Fishermen in the area said that the oil started to collect near the shore from Saturday evening. “Last night we saw that there was only a little bit that had reached the shore but this morning when we got up it had spread,” said R Robbin. Rajesh K, one of the lorry drivers near the harbour said the oil was from a damaged ship. “The oil that ships carry as cargo is much thinner; this oil is the one that is used to run a ship,” he said. Many of the fishermen returned early from sea as they spotted hundreds of fish had died from the oil spill. “We’ve not been able to fish at all today because of the oil,” said R Kishore, a fisherman pointing to the empty nets and boats that had a thick black coating at the bottom, a mark of the spill. M A Bhaskarachar, chairman, Kamarajar Port also said that the oil spill might be a result of the collision but it was difficult to tell because no oil was found near the ships on Saturday. “We are still investigating, we have so many ships coming in everyday so we can’t say which ship it could be from. The Coast Guard will take steps to clean it for now but we have been closely observing the situation and have contained the spill with a floating boom,” he explained. Late Sunday evening, the Coast Guard arrived to clear up the oil and TNPCB officials claimed that there was no chance of the oil spreading any further. But the damage could last decades, say marine biologists and coastal research experts. Pooja Kumar, co-ordinator, Coastal Research Centre said that thick oil usually does mean that it would be crude oil and while oil itself is harmful, crude oil is bound to suffocate marine life. “Ridley turtles are also nesting now, so they are going to be affected. It will also result in a lot of fish kill and oil stains too. Since it is an estuary, the tide reached inland,” she said. “Even though light oil is dangerous, there is still a chance of it dissolving or getting evaporated because it is thin. But crude oil is too thick to dissolve; it is also carcinogenic. Because of the slick, light will not be able to penetrate inside, the dissolved oxygen in the water will decrease and it usually takes decades to fully go away,” said Aswathi Sarath, research fellow, marine microbiology, Pondicherry University. Besides fish and turtles, Sarath said even birds will be affected. “The oil will get stuck to the feathers; mammals that need oxygen will not be able to come to the surface because of the thickness of the oil; and planktons will die. And if the oil reaches the backwaters then the mangroves would be polluted,” she explained.